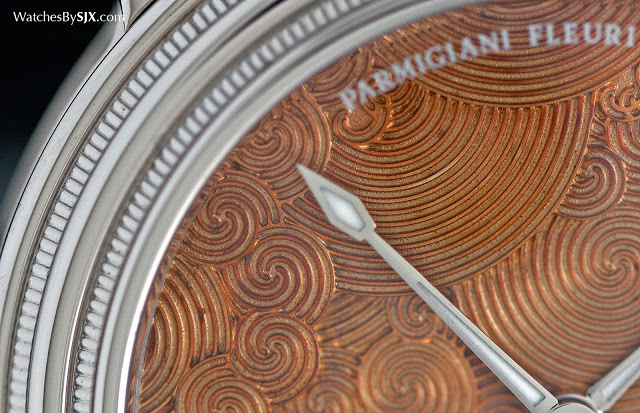 Being a vertically integrated and financially independent watchmaker, Parmigiani has the liberty to do what it likes, and the results are usually admirable. True to form Parmigiani’s line-up at SIHH 2016 was heavy on top of the line high complications, but also included two impressive new movements. Parmigiani’s priciest complications are all finely made, constructed of expensive materials with a visibly high standard of finishing. Their style is conservative, even old fashioned, running counter to the prevailing taste of high rollers in the watch market, whose tastes now lean towards watches from the likes of MB&F and Hublot. 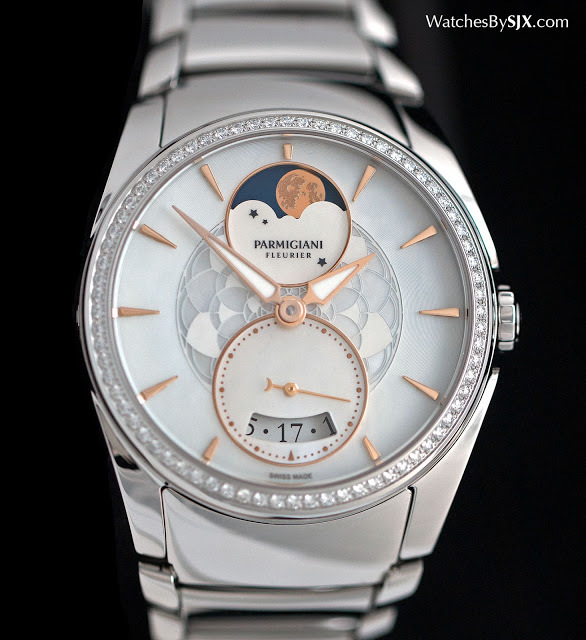 Nonetheless Parmigiani’s quality is impeccable. An example is the new Toric Kaleidoscope Prestige is one such complication, a minute repeater with a turbine-like automaton on the dial. 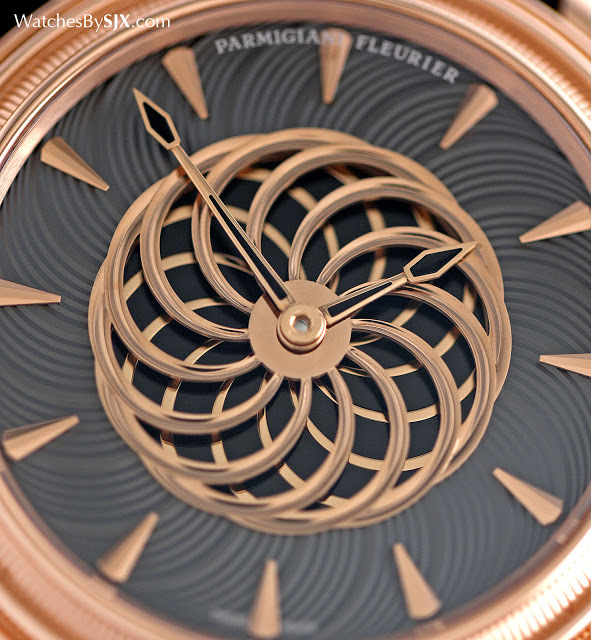 The dial is made of solid gold, with a spiral guilloche on the chapter ring and open-worked in the centre to form a fan-like aperture. 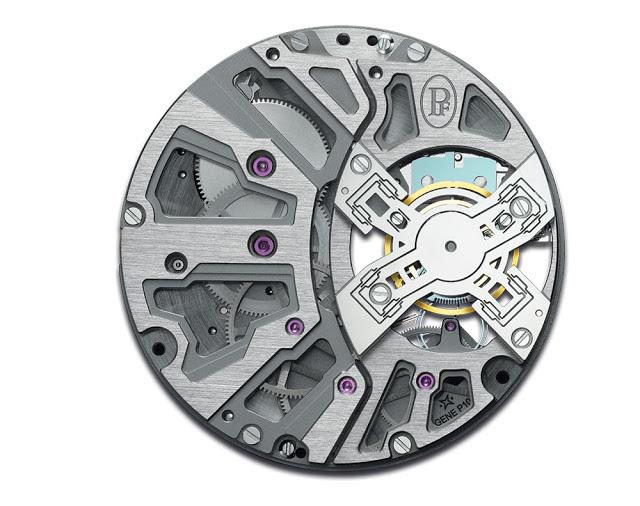 Behind this aperture is a mother of pearl disc with a turbine-like motif that spins when the repeater is activated. 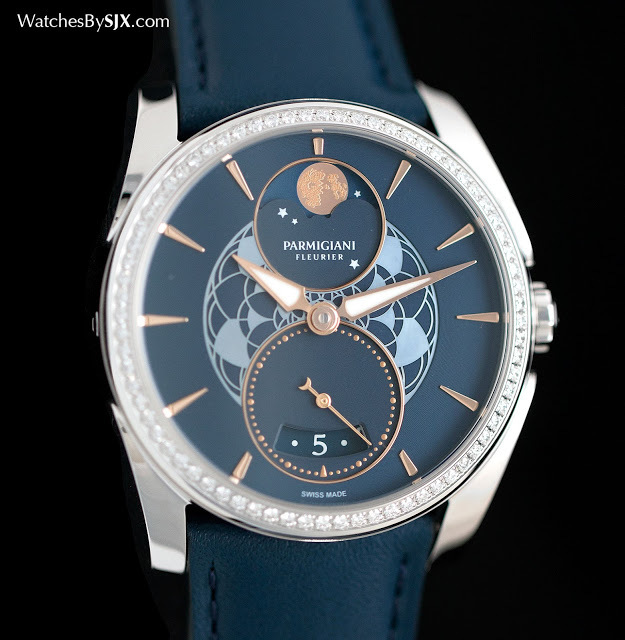 The movement inside is hand-wound, with twin cathedral gongs unusually shaped like a snake. 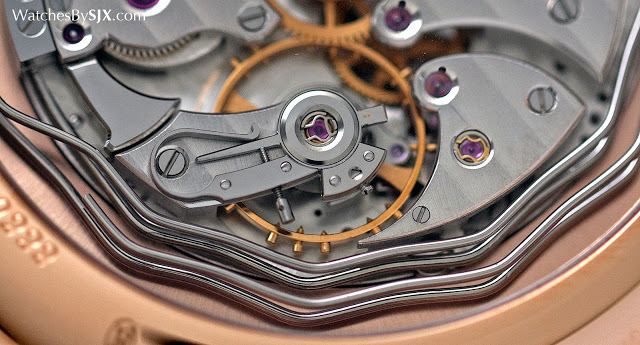 Being twice as long as the circumference of the movement, the gongs have a chime that lingers. 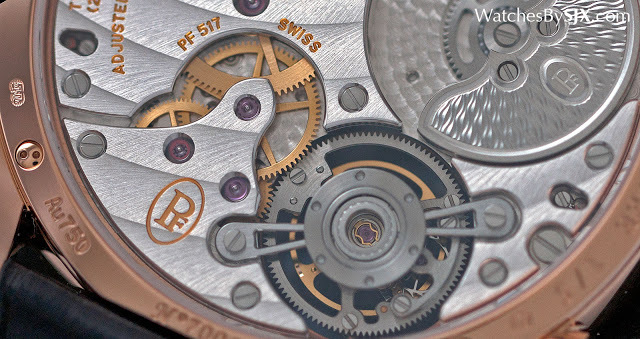 But at 45 mm in diameter, the hefty case is in dense rose gold, which muffles the repeater chime somewhat. 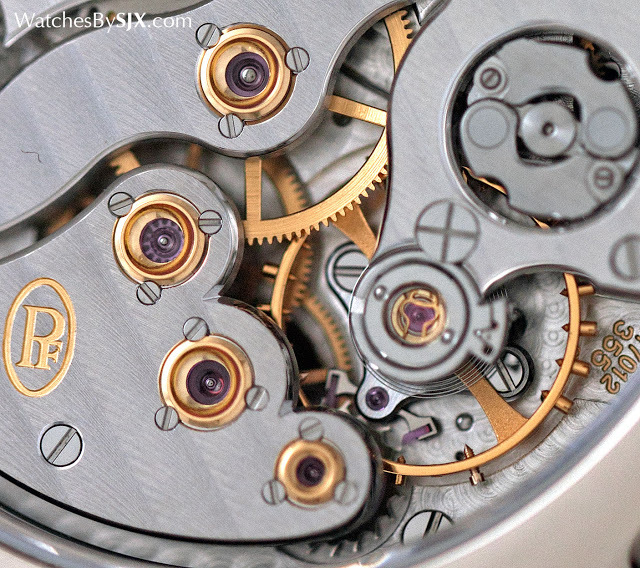 The movement is traditionally laid out, being reminiscent of early 20th minute repeaters, and finely finished. 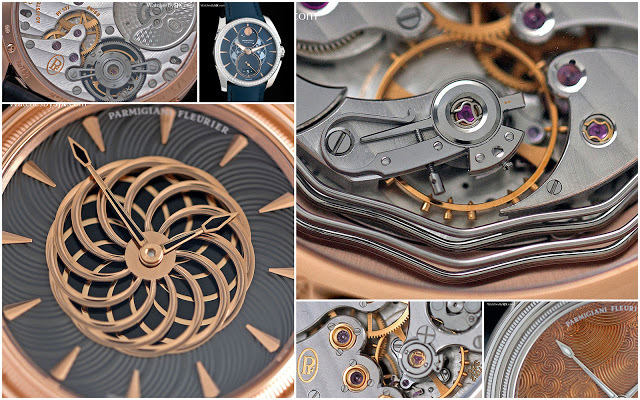 The Toric Kaleidoscope Prestige is a one-off creation with a price tag of SFr495,000. Slightly more affordable is the Toric Quaestor Ripple that’s SFr455,000. 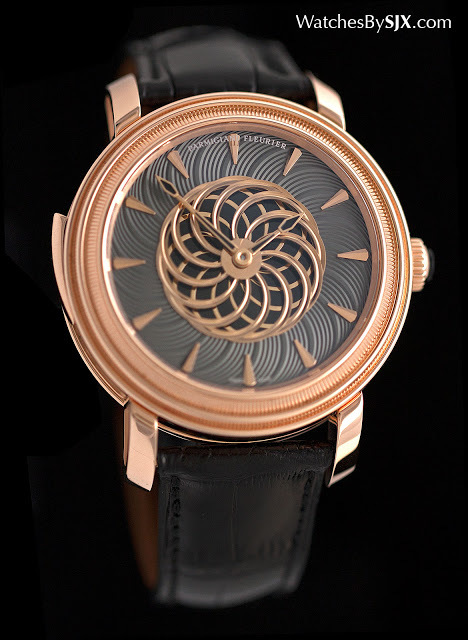 Also a unique piece, it features a solid gold dial with a hand-engraved motif that is inspired by the ripples in the pond of a Japanese garden. 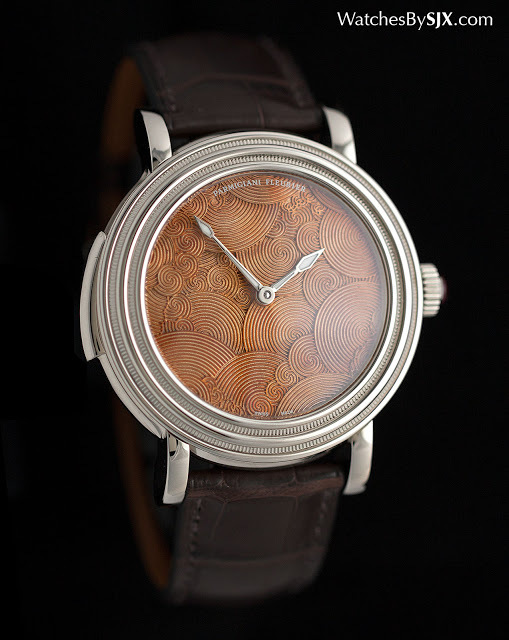 This too has a hand-wound movement with cathedral gongs, though the gongs are of the traditional shape. 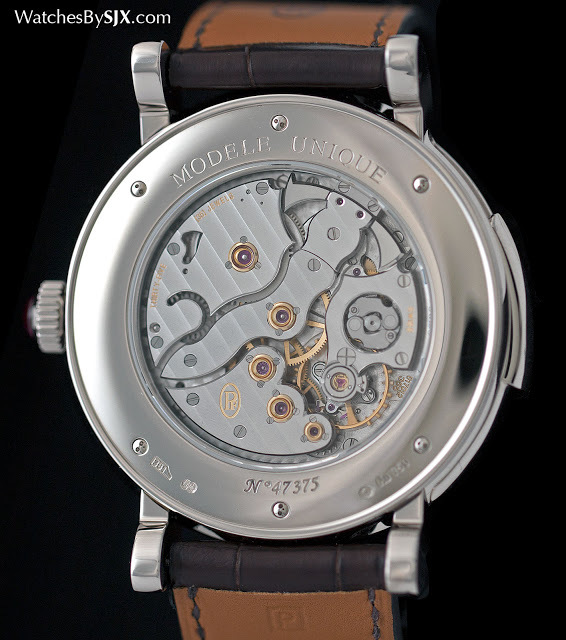 But this is even larger, at 46 mm in diameter, and in white gold, which results in a soft chime. Nonetheless the movement has a classical design, with a beautifully scalloped bridge for the gear train and exemplary decoration. 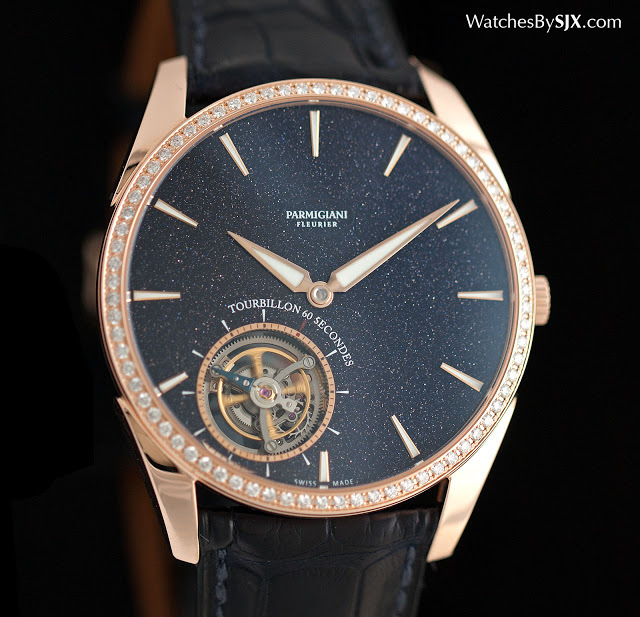 The Tonda 1950 Tourbillon Galaxy is a variant of the ultra-thin tourbillon Parmigiani launched last year. The cosmic suffix in the name is a reference to the sparkly blue dial, which is made of aventurine, a mineral with metallic inclusions that give it a characteristic glitter. 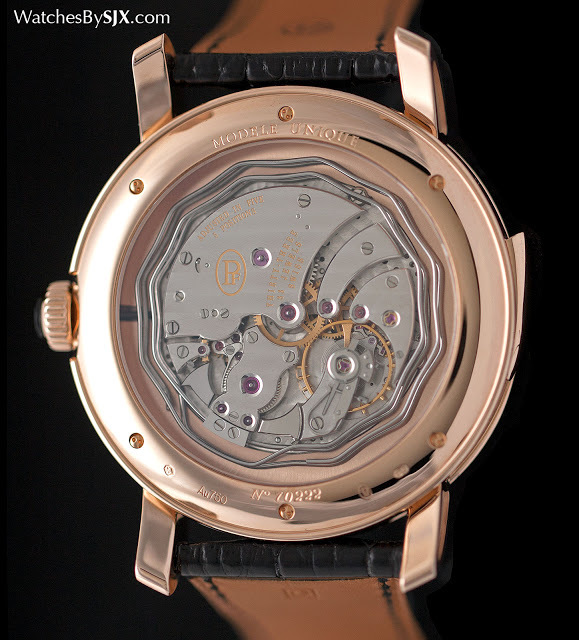 The case is rose gold, 40.2 mm in diameter and under 9 mm high, making for elegant proportions. The bezel is set with 74 round diamonds. This is limited to five pieces, with a price of SFr145,000. 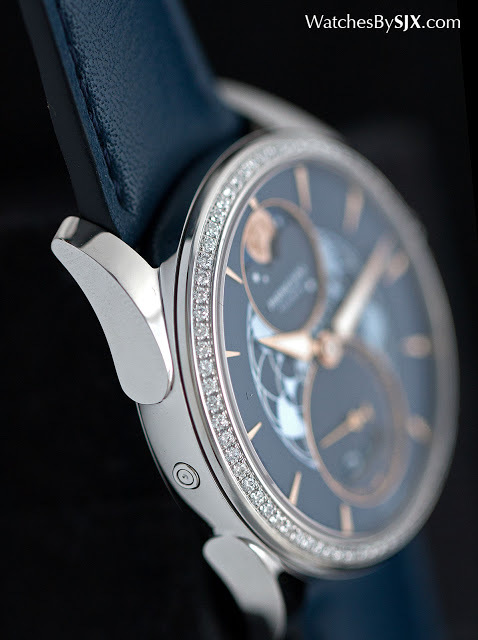 More affordable is the Tonda Metropolitan Selene, a ladies’ wristwatch with a moon phase display that starts at SFr13,000 in stainless steel. This has a mother of pearl dial with an etched lace motif, with gilded hands and hour markers. 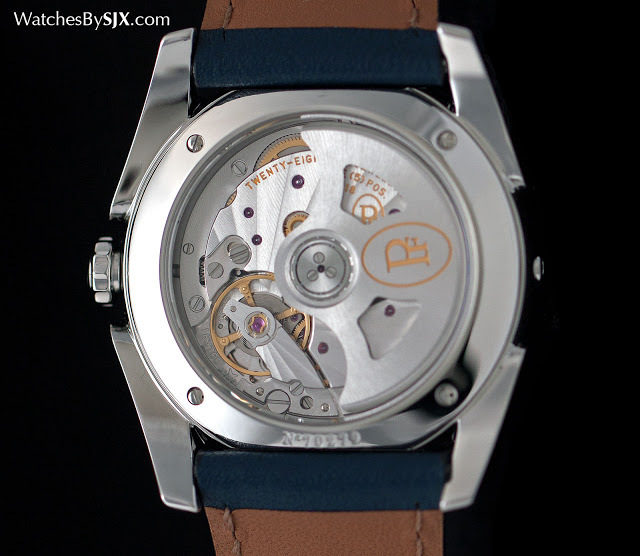 Inside is a self-winding, in-house movement. Though just 33.2 mm in diameter, the case feels substantial, being just under 10 mm high with large, flared lugs. It’s available with a blue or white dial, on a leather strap or steel bracelet. With a diamond-set bezel it starts at SFr15,000. 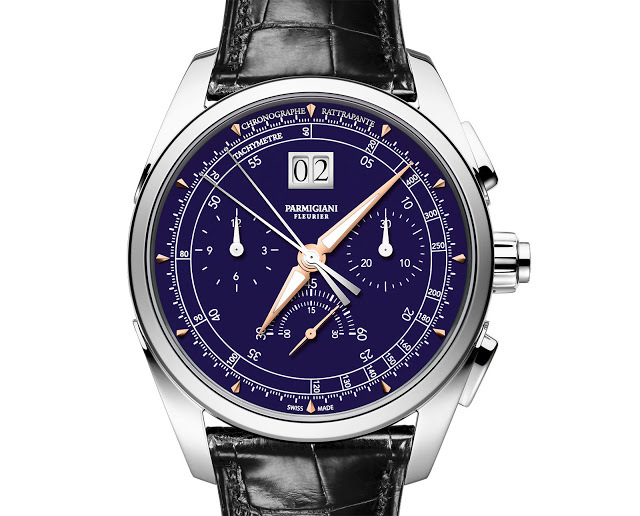 To celebrate its 20th anniversary, Parmigiani also debuted a new movement, the calibre PF361, a hand-wound split-seconds chronograph movement with an oversized date display. It’s found inside the Tonda Chrono Anniversaire, a limited edition of 25 pieces each in white or rose gold, with white or blue enamel dials to match the case. The movement has all the features of a modern, high-end chronograph calibre, including a column wheel and vertical clutch, and unusually runs at 36,000 beats per hour, a frequency shared by only a few other chronograph movements (most notably the Zenith El Primero). 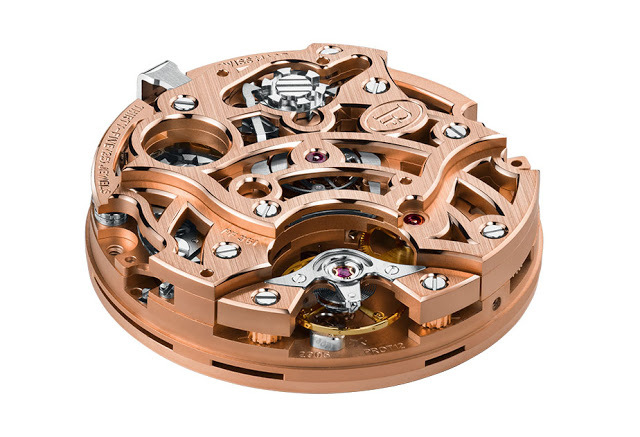 And in the anniversary limited editions has the movement bridges and base plate are in rose gold. The anniversary chronograph costs SFr135,000, but the movement will eventually be found in more affordable watches in a simpler form, and also with the addition of automatic winding. More on this in a future story. Last is the remarkable Senfine concept movement, a work in progress that features the Genequand escapement – named its inventor, a watchmaker who retired from Parmigiani – a highly efficient set-up that extends the power reserve of an ordinary movement manifold. That explains the senfine moniker, which means “eternally” in Esperanto, the constructed international language that never quite caught on. The Senfine prototype runs for 70 days, or more than two months. Parmigiani has indicated the movement will be ready for serial production in several months, but as such things go in watchmaking, the reality is likely to be several years.